The Faculty of Law at the University of Waikato places a strong emphasis on the development of research skills. The classes are small and are typically offered in seminar-style discussions. This approach to teaching at an advanced level creates opportunities for you to share perspectives and discuss issues related to the topic. It'll help you to improve your communication skills and gain expert knowledge. It creates opportunities for you to network with others and renew motivation and confidence. You'll also get a lot of one-on-one time with the lecturing or supervising academic staff. We offer the largest selection of papers in Cyber Law in New Zealand, and therefore you can complete this Masters focusing on this area. The Faculty hosts two research centres: Centre for Environmental, Resources and Energy Law (CEREL) and Māori and Indigenous Governance Centre (MIGC). You’ll benefit from the expert knowledge and national and international professional associations in these fields. For example, you’ll be eligible to apply for the International Bar Association scholarship. Waikato Faculty of Law is the only school in New Zealand that offers this opportunity. Whether your interest lies in Cyber Law, Law of War and Conflicts, Transnational Criminal Law, Indigenous Issues or Environmental Law, you will benefit from nationally and internationally recognised academic staff. Passionate about indigenous issues? This Masters programme will allow you to study in-depth the historical and developing trends within the area of indigenous peoples' rights. You'll develop skills enabling you to participate actively in the development of Pacific jurisprudence and to enhance global understanding of Pacific legal systems. Read more about Master of Laws in Māori/Pacific and Indigenous Peoples' Law. Interested in holding two LLMs from internationally highly regarded Faculties of Law in significantly less time and in two different countries? If you’re a dedicated, engaged student and you’ve successfully completed 90 points of LLM at Waikato (or 75% of our LLM), you could receive 6-8 credits towards the LLM degree at the James E Rogers College of Law, University of Arizona. There are two options on offer for LLM in Arizona: Indigenous Peoples Law and Policy LLM (composed of 24 credits) or International Trade and Business Law LLM (composed of 26 credits). Second Class Honours (second division). To be eligible for the award of honours, you would need to complete you Master of Laws qualification within 12 months (if studying full-time) or within 24 months (if studying part-time) and pass all your papers. The Faculty members come from a wide range of nations and cultural backgrounds, creating a truly multicultural environment. This helps foster in our students an increased awareness of global issues, exposes them to multiple historical and cultural perspectives as well as offer insight into legal systems outside the jurisdiction of the Common Law. 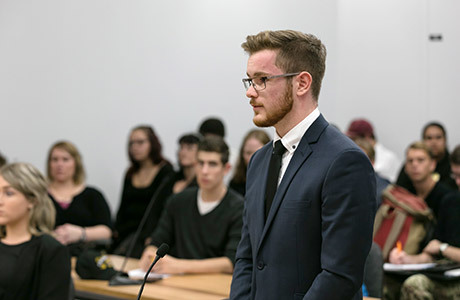 We have the most diverse and vibrant student body of all law schools in New Zealand. Up to 30 per cent of all our students identify themselves as Māori and nearly 16 per cent come from Pacific background. Nearly 40 per cent of our students are over the age of 25. The Faculty's three dynamic law student associations: Pacific Law Student Association, Te Whakahiapo (Māori Student Association) and Waikato University Law Student Associations play an important role of fostering great collegial relationships between students and offer plenty of social and learning opportunities. Our Mentoring Programme will provide extra support and guidance in your studies, help you to navigate through the transition period from school or previous employment to university study as well as advise you on other services and opportunities available to you on campus. Satisfied the prerequisites for graduate study in the subject at a level that is considered appropriate by the Academic Board. In exceptional circumstances, candidates who do not meet these requirements, but who have proven record of academic merit and relevant experience may be accepted into the programme. Students whose first language is not English are required to provide satisfactory evidence of their English language proficiency. An overall score of 6.5 (with at least 6.0 achieved in the Writing band) in the IELTS or equivalent.